Since I’m a leetle bit addicted to making bags, I couldn’t resist making this week’s Zakka Style sewalong tote. I didn’t follow directions very well, though — the zig zags ended up awfully centered-looking, even though I could have sworn I made the panels different sizes. I left my bag a good bit floppier since I like it when my bags can streeetch to fit everything I cram in there. I also made the handles differently (I can’t stand turning tubes), made the interior pocket a zip pocket, and only lazy-quilted the back. Hey Alli, it looks awesome! 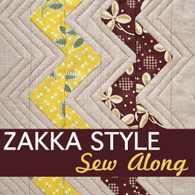 Love that zigzag and your fabrics look great together. Very cute! Do you keep many of the bags you make? Love that green fabric. This is one of my favorite versions of this bag! So I am interested in how you made your handles, because they do look very good. I had soooo much trouble with this pattern and it was my first bag. I love your color and fabric choices! I also like how you “lazy” quilted the back. I will use that idea sometime… Your tote is so springy!